For years, OSHA's regulations for workplace safety signs have been based on outdated formats that were not aligned with the latest safety sign, color and tag standards. Up until September 11, 2013, the OSHA regulations only cited the 1968 Z35.1 safety sign standard (which is almost identical to a 1941-era version of the same standard), the 1968 Z35.2 tag standard and the 1967 Z53 safety color code standard. Needless to say, much has changed in 40 years, including what’s considered to be the state-of-the-art for warnings technology. In 2013 OSHA changed the situation by incorporating references to the latest ANSI Z535 standards for safety signs, colors and tags into their regulations. Though you can still use the older signs and tags because OSHA maintained the older sign, tag and color standards’ references next to the newer ANSI Z535 references, the new regulation change is an opportunity for all organizations to rethink and improve their workplace safety signs and tags. Risk managers and safety professionals responsible for workplace and public safety (such as in airports, train stations, hotels, and golf clubs) will want to seriously consider using the new ANSI sign standards; the bar for safety communication has risen. If and when accidents happen, liability issues related to out-of-date signage could occur if the older signs are still in use. The newer ANSI Z535 safety sign formats have a long-standing reputation in product liability law as defining what constitutes an “adequate warning” in U.S. courts. “Failure to warn” and “inadequate warnings” are making their way into premise liability lawsuits and the newer, more content-rich, ANSI Z535 signs now included in OSHA regulations will help to provide a solution. As the chair of the ANSI Z535-2 Standard for Environmental and Facility Safety Signs from 2008-2011, Clarion's CEO, Geoffrey Peckham, spearheaded the effort to update OSHA’s safety sign, color and tag regulations. His goal was to better align OSHA with the latest advances in safety sign technology so better safety communication would take place in our nation’s workplaces. His six years of work included the creation of side-by-side (old versus new) standards comparisons, the writing of key justification points, several meetings at OSHA headquarters in Washington, DC, and testimony to OSHA committees gathered to review the change. In a nutshell, here is why the new signs and tags are better – and why OSHA was able to justify the change. The new signs and tags typically provide more substantial information so people are able to make more informed, safer decisions. Most ANSI Z535 hazard alerting signs describe the nature of the hazard, the consequence of interaction with the hazard, and how to avoid the hazard. The older signs rarely include this level of information. The concepts contained in the ANSI Z535 standards are supported by human factors research on what makes for an effective warning. The old signs and tags lack this level of sophistication. The new signs use signal word panels that are based on modern two-tier risk assessment methodologies that factor in both hazard severity and probability. The old signs, in contrast, use only “immediacy” of the hazard to determine whether to use DANGER or CAUTION. 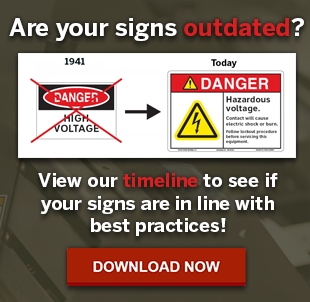 The result of this outdated logic is that DANGER can be used for both “HOT” signs and “HIGH VOLTAGE” signs because both are “immediate” results of interaction with the hazard. The obvious flaw in this approach is that the resulting injuries are vastly different in severity; one typically results in mild or moderate burns and the other often results in death by electrocution. The ANSI Z535 standards would use CAUTION for the hot surface sign and DANGER or WARNING for the hazardous voltage sign. The newer formats better accommodate the use of multiple language panels and graphical symbol panels; both of which are used to communicate safety to non-English readers. The old signs rarely do this and when they do, it’s awkward at best. The ANSI Z535 standards contain design principles that exemplify current legal criteria for "adequate warnings" as defined by the past thirty years of U.S. case law. The old signs fall far short of this measure. Clarion is helping organizations rethink safety with our new line of facility safety signs, tags and labels that help facility owners to more effectively reduce risk and protect people in today's heightened regulatory and liability environment.